There are innumerable recipes for vegan mac and cheese on the internet. I’ve tried a lot of them. 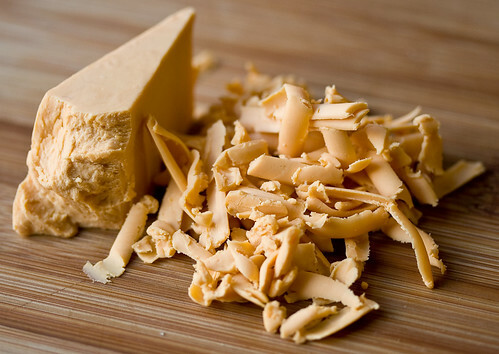 Some of them simply call for “slices of soy cheese” and some vegetable stock to be mixed over pasta. The majority, however, require nutritional yeast, and they usually also require making a roux. The recipe below is from my upcoming cookbook, and it’s one of my favorites. However, if you’ll indulge me for a moment, there are some things about vegan mac and cheeze I want to talk about. Now, I’m the first to admit “Mac and Yeast” doesn’t quite have the same ring to it. That’s why I tend to call it “Mac and Cheeze”. But I’m also the first to admit that these recipes, even the best of them, don’t really taste all that much like mac and cheese. Some get much closer than others, and a lot are downright tasty. But it’s not cheese. Your omnivore or veggie friend/spouse/child may love it as much as or even more than the real stuff (if you’re lucky), but they probably love it on its own merits, not because they really can’t tell the difference. But you know what? It doesn’t have to taste exactly the same for me to love it. A lot of people, myself included, are really interested in making vegan food that’s indistinguishable from the “real” thing. It’s a fun challenge, and oftentimes, a challenge where you can really and truly be successful. But there are many instances where you don’t create something identical, but what you do create is actually good. Different, but yummy. 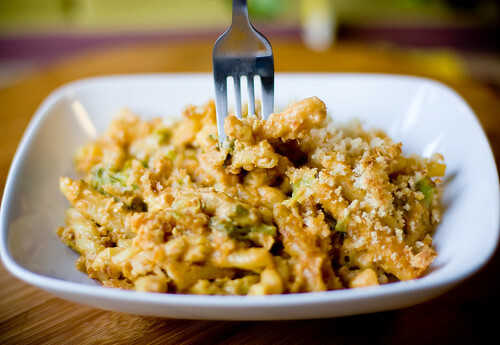 While vegan mac and cheese doesn’t taste exactly like non-vegan mac and cheese, it satisfies the same craving. It’s rich and creamy and salty and vaguely cheese-like. It’s a yummy, thick creamy sauce to top noodles with. I think that sometimes it’s enough to satisfy your cravings with something similar, if you can’t find something identical. After three years of being vegan, I don’t even crave mac and cheese anymore; I crave mac and yeast. I think expectation is important with food. If it looks like a grape, you expect it to taste like a grape. If I hand you a glass of sparkling wine and tell you it’s gingerale, you might be put off when you take a sip. You might even like wine, but you expected it to be, well, not wine. If I say, “here, try this mac and cheese” and give you mac and yeast, you might be disappointed when you tasted it. If you’ve never tried a mac and yeast recipe before, and you want to try this one, keep in mind that it doesn’t taste like cheese. It just tastes like yummy. Well, it does to me and the vegans that tested the recipe for me! Begin by heating a sauce pan and adding the earth balance. Once melted, add flour and whisk vigorously until a smooth paste forms, called a roux. Be careful not to add flour to a pan that is very hot, or your roux will be lumpy and you’ll need to start over. If you mix in the flour as soon as the margarine is melted and you should avoid any problems. To this paste, add tamari, lemon, miso, tahini, and tomato paste and whisk until well incorporated. The mixture should still be paste-like. Then slowly pour in the soymilk, whisking constantly, until it is completely incorporated. Add the yeast and mix well. Cook the mixture until it thickens, whisking often. This should take approximately 5 minutes, but it’s flexible. Add salt and pepper to taste. I like this the most baked. Cook 3 cups of dry, small pasta (like elbows or shells or rotini) and toss with the finished cheezy sauce. Add steamed broccoli (pictured) for a real treat. Top with fresh breadcrumbs and bake at 400Âº for 25 minutes, or until browned and bubbly. I, too, have to say THANK YOU for this great recipe. Really delicious! We sub almond butter for the tahini thanks to a sesame allergy in our house, but it still is wonderful. I have also made this sauce to put on top of other casseroles and it’s great. Thank you! March 10, 2010 - 10:05 am Pingback: A Greener Life » Blog Archive » Cheezy Quinoa Casserole - Making greener choices every day. 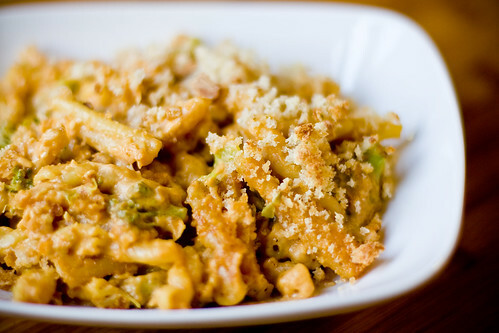 October 19, 2011 - 8:39 am Pingback: cauli’ mac: adapting the veg news mac n’ cheeze « corrina, darling!